Welcome! I am [aka Soma] the Director of the IMB X-Ray Facility specializing in macromolecular single crystal X-ray diffraction at Kasha Laboratory, Institute of Molecular Biophysics. My official designation is Senior Research Associate (12 month non-tenured faculty) at Florida State University, Tallahassee, Leon County, Florida 32306-4380. 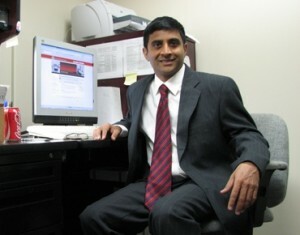 I have been associated with FSU and the X-Ray Facility (XRF) since 1993. I train and teach students how to collect and analyze macromolecular X-ray diffraction data using both home and synchrotron x-ray sources. I also manage the day-to-day operation and maintenance of the X-Ray Facility hardware and software (see historic photos and data . IMB XRF also provides crystal screening service for proteins with the help of ARI Crystal Gryphon robot, and facilitates the X-ray data collection at SER-CAT beam line in Advanced Photon Source at the Argonne National Lab. Since summer 2013, I also maintain two powder x-ray diffraction equipment: Rigaku Ultima III w/ Mercury CCD and PANalytical X-Pert Pro Powder at CSL 1011. I serve as a safety liaison for Kasha Lab and coordinate with FSU Safety Office. During the fall semester, I train the in-coming graduate students the practical aspects of macromolecular crystallization and x-ray diffraction data collection. The three week training, XRF Protein Crystallization & X-Ray Diffraction Workshop [aka, 2017 Boot Camp | Schedule] is part of the Core Facilities Training Workshop. During the summer, I work with the Department of Biological Science’s six-week residential science and mathematics Young Scholars Program. I am a co-author on several peer-reviewed publications. I have been involved in FSU Scientific Equipment Portal since 2012 and our team won the 2017 Prudential (Davis) Productivity Award for the work and we were an exhibitor at 2018 Discovery on Parade. I have organized Pittcon Conferee Networking Events about Funding for mid-size equipment (2016 in Atlanta, GA) and Core Facility Opportunities and Challenges (2018 in Orlando, FL) and presented poster about the robotic microscope ver-1 and ver-2 at PITTCON and at FSU 2016 DigiTech. I am a member of the Florida Core Network and a member of Association of Biomolecular Resource Facilities. I organized the Florida Core Network Event 3 on Aug 11, 2016 at FSU. In 2016, I was selected as the Treasurer for Southeastern Association of Shared Resources. The fiftth SEASR meeting was held in Tampa, FL, Jun 7 -9, 2017 and the sixth SEASR meeting will be held in Atlanta at Emory Conference Center, GA, Jun 27-29, 2018. Fast and accurate imaging of crystal screen 96-3 and 96-2 plates are facilitated by IMB designed home built simple robotic imager which was demonstrated for 96-3 plates in 01/13/2016 and cell culture 96-0 well plates on 02/22/16. The single axis version’s proof of concept has been shown on 07/18/2016. I presented both dual and mono axis robot work at 2016 ACA Denver Meeting and FSU 2017 Life Sciences Symposium. Version-2 of the robot is now being tested. I have also helped host the Caspar Structural Biology Symposium [Photos] in Jan 2017 at FSU CSL Auditorium. I attended the 2013 FSU Spring Convocation and 2017 FSU Spring Commencement ceremonies. 32.’The structure of lombricine kinase: implications for phosphagen kinase conformational changes‘, D.J. Bush, O. Kirillova, S.A. Clark, O. Davulcu, F. Fabiola, Q. Xie, Thayumanasamy Somasundaram, W.R. Ellington, and M.S. Chapman. J. Biol Chem. 286, 9338-9350 (2011). 30.’Spackling the crack: stabilizing human fibroblast growth factor-1 by targeting the N- and C-terminus β-strand interactions‘, Vikash Kumar Dubey, Jihun Lee, T. Somasundaram, Sachiko Blaber, and M. Blaber. J. Mol. Biol. 371(1), 256-268 (2007). 29.’Conversion of type I 4:6 to 3:5 ß-turn in human acidic fibroblast growth factor: Effects upon structure, stability, folding, and mitogenic function’, Jihun Lee, Vikash Kumar Dubey, T. Somasundaram, and M. Blaber‘. Proteins: Structure, Function, and Bioinformatics. 62(3), 686-697 (2006). 28.’An atomic resolution structure for human fibroblast growth factor 1′, Matthew J. Bernett, T. Somasundaram, and M. Blaber‘. Proteins: Structure, Function, and Bioinformatics 57(3), 626-634 (2004). 27.’The putative catalytic bases have, at most, an accessory role in the mechanism of arginine kinase‘, P.S. Pruett, A. Azzi, S.A. Clark, M.S. Yousef, J.L. Gattis, T. Somasundaram, W.R. Ellington and M. S. Chapman. J Biol Chem 278(29), 26952-57 (2003). 17. 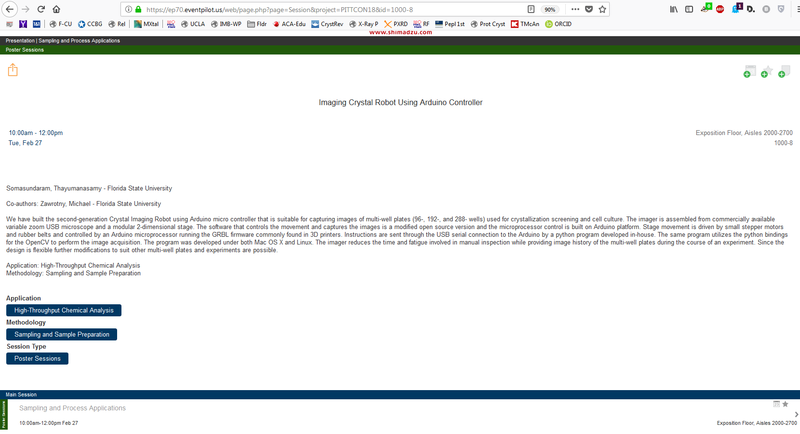 Imaging Crystal Robot Using Arduino Controller, T. Somasundaram and M. Zawrotny, 2018 Pittcon Expo & Conference, Orlando, FL. 16. Mono and dual axis crystal imaging robot, T. Somasundaram and M. Zawrotny, 2017 SEASR Meeting, Jun 7-9, 2017, Tampa, FL. 15. Simple Imager for Multi-Well Plates, M. Zawrotny, and T. Somasundaram, 2016 PITTCON, Mar 6-10, 2016, Atlanta, GA.
14. IMB XRF-Core Facility, T. Somasundaram, 2015 Fifth Annual Life Science Symposium: Ageing, Tallahassee, FL. Feb 19-20, 2015. 12. ‘FSU Core Facilities: Biophysical Cores‘, D. Sousa, B. Chen, C. Mundoma, and T. Somasundaram. 2014 Fourth Annual Life Sciences Symposium:Frontiers in Biomolecular Communication, Tallahassee, FL, Feb 13-14, 2014. ‘Low-cost home-built imager for protein screening‘, 66th Annual Meeting, American Crystallographic Association, Denver, CO, Jul 22-26, 2016. ‘Funding/Upgrading for Mid-size Equipment‘ 2016 PITTCON Conferee Networking Event, Atlanta, Georgia. Facilitator, Symposium, Caspar Structural Biology Symposium, Jan 7-8, 2017, Tallahassee, FL. Treasurer [2016-19], Southeastern Association of Shared Resources, an ABRF Affiliate. Organizer, Third Florida Core Network Event, Aug 11, 2016, FSU, Tallahassee, FL 32306.